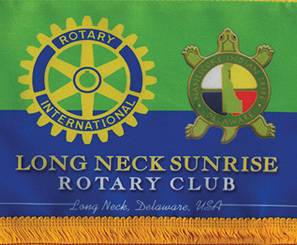 The Long Neck Sunrise Rotary Club was chartered in August 2010. The club is a part of Rotary International District 7630, covering Delaware and Southeastern Maryland. Our Annual Charity Golf Tournament is the keystone of our fundraising efforts to support local and international charities, already donating $63,000 since our founding. Our accomplishments include the sponsorship of 12 students to the Rotary Youth Leadership Awards Camp since 2011 based on the endowment established to memorialize former Rotarian Rick Willman. We have participated in Boxes to Afghanistan, Shoe Boxes to Haiti and Shelter Box USA as well as obtained Rotary District Grants for the Delaware Children’s Burn Camp, the Oak Orchard Riverdale Boys and Girls Club who participated in the MLB Pitch, Hit and Run Competition and Long Neck Elementary School in the 3rd Grade Dictionary Project. We have also participated as an International Sponsor for global grants to purchase medical equipment for cataract surgeries in India, to purchase cows to establish women farmers in India, and to develop two clean, fresh water sources and 150 family sanitation facilities for Nalerigu, Ghana. Please feel free to “take us for a test drive” by joining us for any of our weekly breakfast meetings held every Tuesday morning at the Ocean Grill II on Long Neck Road at 7:30 am. You can meet our club members and learn about our networking, community and international service opportunities as well as hear an interesting presentation from someone in our local community.